Public clouds like the Google Cloud Platform (GCP) have become attractive options for businesses migrating to the cloud. To effectively deliver applications with a consistent experience and ensure optimal performance, enterprise-grade application services such as elastic load balancing, security and analytics are needed across on-premises and clouds. While the Google Cloud Load Balancer offers distributed, software-defined features, it lacks advanced features such as: multi-cloud support, content-switching, caching, and application analytics / monitoring. The Avi Vantage Platform is a multi-cloud application services platform that offers load balancing, web application firewall, and service mesh capabilities. Unlike Google Cloud Load Balancing, Avi Vantage is a full-featured load balancer that provides ludicrous elasticity through on-demand autoscaling and end-to-end automation for L4-L7 services. Avi App Insights also provide unparalleled visibility and analytics for real-time application health, end-to-end timing, traffic logs, security insights, client insights, giving you more control over application performance than exclusively using the Google load balancer. 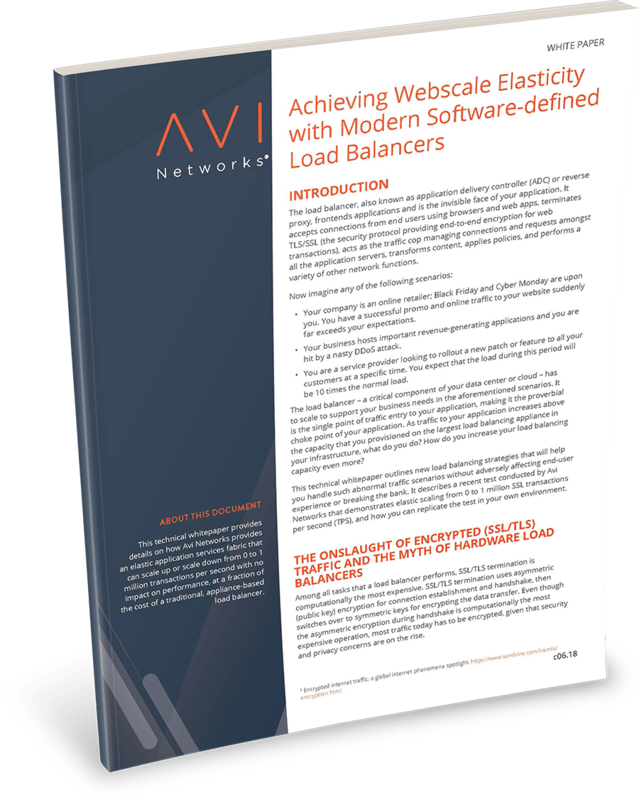 Avi’s software-defined architecture supports multiple load balancing algorithms, advanced HTTP/2 content-switching, SSL offload, DNS, GSLB, security (iWAF), and compliance across on-premises and multi-cloud environments. Provides an elastic application services fabric that can seamlessly scale up or scale down from 0 to 1 million transactions per second (TPS) with no impact on performance. Achieve per-application load balancing with on-demand scaling where the Google load balancer alone falls short. Avi Vantage provides customizable application health monitoring, end-user experience, log analytics, and security insights. Avi App Insights display real-time visualization in an intuitive dashboard, making it much easier to troubleshoot applications compared to only using Google Cloud load balancing. Learn how Avi Networks can scale from 0-1 million transactions per second (TPS) and scale back down on Google Cloud Platform with no impact on performance, at a fraction of the cost of traditional appliance-based load balancers. Elastically scale from 0 to 1 million transactions per second.